One of the most frequent questions that I get is, “What are the best trad clothing brands?.” This is a difficult question to answer, but here is the answer that I usually provide. It is easier for me to tell you clothing stores where you can find trad clothes rather than identify a few brands that are trad. Some of the stores that I have listed below are brands or have in-house brands, but others stock lots of brands. The stores below stock almost nothing, but trad clothes. You can almost shop blindfolded and come away with nothing but the good stuff (be careful at Brooks Brothers though). Everyone on my list has an online presence which was one of my requirements. However, outside of O’Connell’s, J.Press, and Brooks Brothers you may have to place a phone call to check on sizing, availability, etc. What do you think of the list? Is there anyone that I left off? Anyone on this list that you would remove? I took stock of my sweaters this week. I also took a pictures because I knew a few people that might be interested in seeing them. There are plain Shetland sweaters, brushed Shetland sweaters, lambswool sweaters, and more sweaters. If I were to pick my favorite sweater out of the bunch it would be the fisherman sweater that my sister knit for me. After that it is a toss up between the Salmon Spirit of Shetland sweater or the Brooks Brothers Clipper blue Shetland. I also really like pink brushed sweater from Ralph Lauren. It is a lambswool/Cashmere blend and it does not disappoint. If I have learned anything from all of these sweaters it is this. Mid-grey sweaters are the most useful. Saddle shoulders are the best. You can never go wrong with a Shetland sweater. Enjoy the pics! It’s 42 degrees outside as I type this. On Monday it was 80 degrees and I was wearing shorts. Today I am contemplating donning a toboggan. Fall can be like that. The images below show how I managed to stay warm or cool as the temps fluctuated. Some things like the red shirtjac and the green vest you will continue to see but the shorts, polos, and madras will soon be put away for the season. Winter is coming. 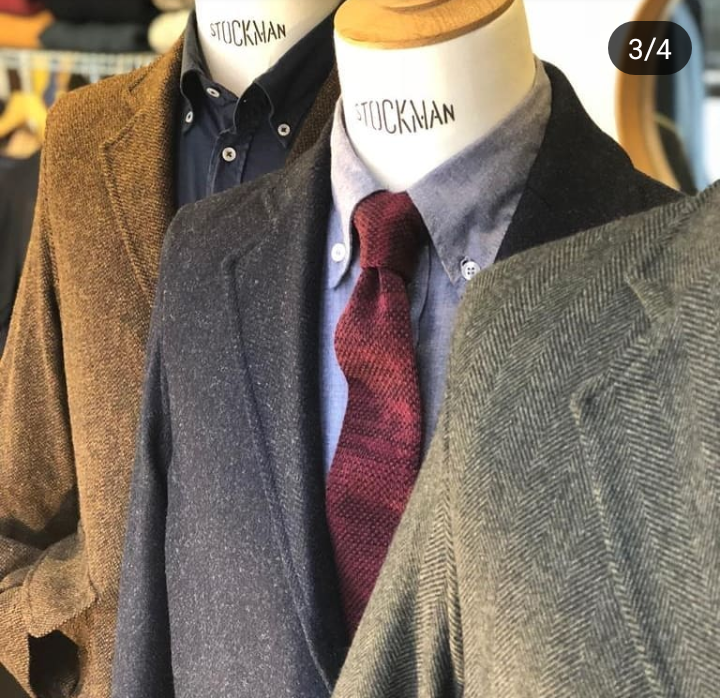 While I am not in the market for a new tweed sport coat I pretended that I am for this post which is easy to do for your average trad. I went into this search knowing that I would be unable to get all trad trimmings that I want without going MTM which is expensive and time intensive or going to O’Connells or J.Press. My problem with OCs and J.Press is that most if not all of their jackets lack patch pockets. That is currently a deal breaker for me. In the making of this list the two highest items on my list are natural shoulders and patch pockets. As much as I love a 3/2 roll I think that I could settle for this 2-button dart-less sack tweed from Sid. They actually offer a 3/2 sack, but this color and pattern spoke to me so much more. I would prefer that my patch pockets be flapped but this seems to be a growing trend. I am not opposed to it as it pushes the casual vibe that I am going for with patch pockets in the first place. This is a great looking jacket. John Simons is offering the sport coat above in 3 colors. I am a big fan of olive in general and I am loving this jacket. It looks kind of Keydge like which is not a bad thing. I like the casual look of an unlined jacket when it is done right. My recent positive experience with this brand (John Simons Shirts) has left me wanting to try this tweed jacket out. Drake’s has been consistently doing good things with their there brand if you ask me. While they aren’t exclusively an ivy/trad brand they appear on the Venn diagram occasionally. This unlined but darted and side-vented 3/2 sport coat in an autumn-ish pattern is very nice looking. At $1,395 we are in MTM range, but one of the upsides to OTR (off the rack) is that you can simply return it if it does not work out. It looks well made and like they used quality materials, but for my intended use it could benefit from some swelled edges. This looks like it would work better with grey flannels than khaki chinos. I like both of these jackets a lot despite those enormous pockets and the darts. Despite those defects they have a nice overall look. The brown one is labeled as a suit jacket will work just fine as a sport coat because the of those patch pockets. The other is a tick weave I which I know that I really like as one my sport coats has this. It is a great texture. Still not sold on the pockets. I should have called this post the fall sport coat post and not tweed. I see that now. If I were considering a new sport coat I would be leaning towards that John Simons jacket up there. It looks great and it is nice to get everything that you want for $500. Sid would be second on my list, but fit is ultimately what would cement my decision.